QUBOT is a service-driven small business. We have no links to manufacturers or distributors so you know you will get the real deal - I am not here simply trying to sell new brushes and batteries! 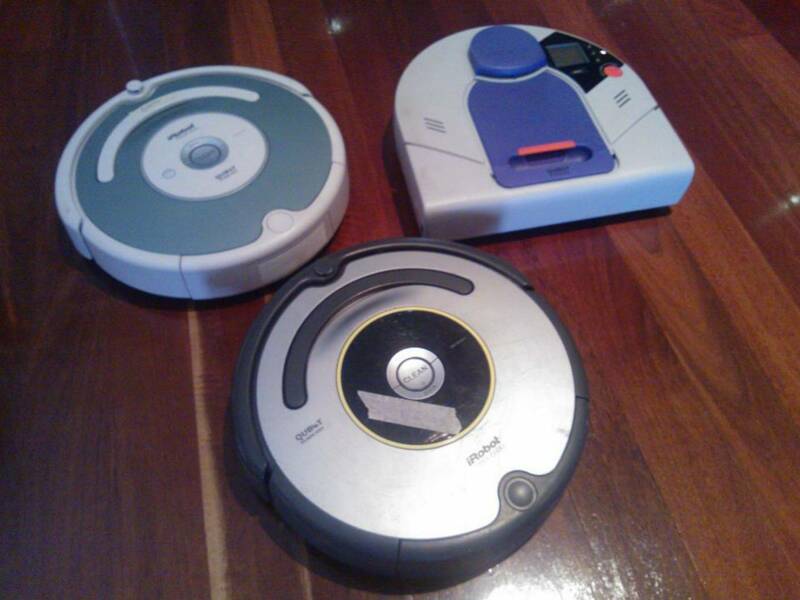 > SERVICE and REPAIRS of ALL brands of robot vacuum cleaners. > ROOMBA going in circles? Robot vacuums have come a long way! No longer are they gimmicks or toys, but they are serious help in keeping your floors clean. Regular cleaning of brushes etc is important but there these units do require a full service periodically! Dust and hair enters the drive gearboxes and will start to destroy parts requiring expensive replacement. I recommend that this is done every 18 months to two years, but it does vary based on the amount of dust and hair in the house, pets etc. While servicing I clean and re-lubricate all brush drives, I remove dust build-up from the impeller of the blower (see pics), and I clean and check all the IR sensors as well as giving the unit a thorough clean. Contact me to ask any questions you might have about your robot vacuum cleaner and how to get the best service from it! > I specialise in all iROBOT ROOMBA and all NEATO robot vacuum cleaners! > RoboMaid; Hoover; Pursonic, X500 and other machines are mostly cookie-cutter Chinese machines with branding stuck on them. I have worked on these, but due to lower replacement values, there is little demand for spare parts and so these spares become difficult to source. > Based in Perth, WA I offer a pick-up and drop-off service covering the Perth Metro area. I charge $55 for this service (that is $55 for BOTH). > The postal service covers all of Australia. NB! I must apologise up front. I have been very busy of late and it can take more than a month before I get to your machine. - Once I have gone over your machine completely, I will put together a proposal for repair and/or servicing, and phone you. I will explain what is needed and why, and go over any options, and itemised costs and give a bottom line total for the options that you select. - Once I have a go-ahead, I will generally be finished within a few days and can post back / schedule drop off / let you know to collect, as the case may be. This may be affected by spares on back-order, but I'll let you know if this when I call you. Historically, in the first few years of operating this business it was, like many startups, a bit up and down. We all know that banks don't have much of a sense of humour when it comes to mortgages - if you struggle with this statement, you probably don't have a mortgage! So I took on a part time job to give me a base-line income close to covering the mortgage. It's a good job, nothing flash, but reliable. Fast forward a couple of years, and there has been steady growth. In spite of stopping all direct promotion and advertising, I have had a steady stream of new customers. I have also had a very encouraging high percentage of referral business, steady growth in commercial customers and repeat business - customers calling in to send their machine for a service - it's not broken, just want to service it again. This is great and a validation of the quality of work I'm doing, but I am now struggling to keep up with both, but not yet ready to go all-in again. I have a few plans in place to rectify in the longer term, but for the mean time I am working nights and weekends. Just know one thing - I will not compromise on the standard of service or the work that I do. > When you get your machine back it will have an invoice with the agreed items / cost, also showing my banking details. Once you have the machine vacuuming around your ankles, hop on the Internet and make a payment. > If you prefer to pay cash or other, then please let me know in advance. I will endeavour to provide interesting and relevant content! Call, text or email to discuss your robot!